Other names: European Raspberry, Framboise, Red Raspberry. 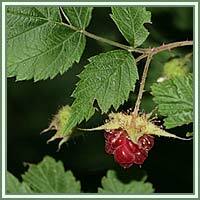 Habitat: Raspberry is native to temperate regions of the world - Europe and northern Asia. It can usually be found in rich, moist forests, under trees and in denser stands in clearings. 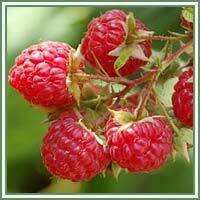 Description: Raspberry is a low perennial, deciduous plant. During the first year, stem grows unbranched to its full height, and during the second year it produces several side shoots with smaller leaves. Leaves are alternately arranged, large and pinnate, with five to seven leaflets on the main stem, and three to seven on the side shoots. Flowers are five-petaled, produced in late spring, white to pale pink in color. Fruits are produced in summer or early autumn. What appears to be a red berry is in fact an aggregate of drupelets, usually ruby red when fully mature. Useful components: Flavonoids, polypeptides, tannins, vitamins A, B1 and C.
Medicinal use: Traditionally, Raspberry was used in treatments of anemia, diarrhea, gingivitis, sores, leg cramps and morning sickness during pregnancy. Nowadays it is mainly used for its astringent and stimulant properties. A strong tea made from the plant is useful in cases of sore throat and inflammation of the mucous membrane. Tea made from the leaves is beneficial in treatment of stomach disturbances and diarrhea. A decoction made from the leaves can also be used as eyewash against conjunctivitis, as a mouthwash and can help in reduction of excessive vaginal discharge. Applied directly onto the skin, it helps in cases of wounds and ulcers. Raspberry leaves are very useful during pregnancy: they can help relieve the feeling of sickness, sedate and relax, alleviate pain caused by contractions during childbirth and improve lactation. Safety: Raspberry could cause nausea and loosening of the stool. Some herbs could react with certain medication. Therefore it is advisable to contact your doctor/herbalist before consumption of any herb.